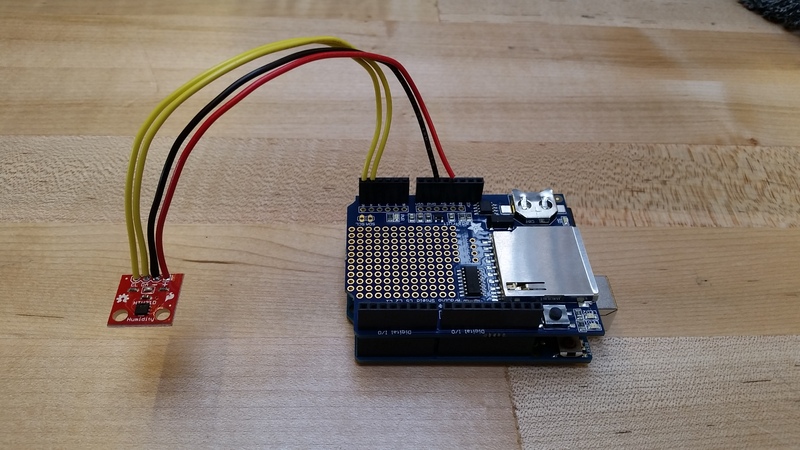 We wired and coded an Arduino temperature and humidity sensor to be used to record compost data onto an SD card in a classroom setting. This device was built in collaboration with a professional development program at Albany High School. While the sensor is not ground breaking the process we went through creating professional development plans exposed the teachers to new methods of teaching and learning and allows teachers to incorporate the device into the classroom. As we worked with the schools we came across a number of constraints that changed the design. The teachers would not be able to give the Arduino internet access through Wi-Fi or Ethernet and there also wasn’t necessarily an outlet for the device. We found that some of the sensors needed slight calibration and having teachers add in the calibration to the code gave them some ownership of the code. While not a difficult process, allowing the teachers to gain ownership of the code was very helpful, as they then felt more invested and connected to the device. A number of different groups were interested in using the device including science teachers and the gardening club. Through their feedback we were able to define our long term goals for the project. Working with the teachers helped our group define a direction we would like to see our project go in the future. As the code was not all ours and the sensors and Arduino are easy to acquire, open source was always our goal for the project. We wanted to create a disruptive system for the education system. By working with the teachers and giving them a safe and easy way to enter the world of Arduino, we hope they will harness the technology in their classroom in the future. After being introduced to the technology they realized the ease of connecting new sensors to the device and teaching their students from a hands on approach. We envision a future where teachers post their lesson plans online where other teachers can adopt and improve them. The online community is perfect for the education system as it allows for constant improvement and support. If a teacher runs into a problem, they can simply ask the internet for assistance. Our other goal is for students to see the Arduino code and become familiar with the Arduino environment. This will make them more comfortable with experimenting and trying new projects on their own. One of the main applications for the temperature and humidity sensor was with compost. The teachers at Albany high school along with the gardening club wanted to monitor the variables in the compost piles. Although the sensors we gave them only monitor temperature and humidity, there are a number of other factors that could be monitored. The most important factors in a compost pile are gas ratio, temperature, moisture, and pH. The two gases that need to be monitored are carbon and nitrogen, with a desired ratio of 30:1 Carbon: Nitrogen. This ratio could be measured with a gas sensor, but our professional development group was not interested with gas for the initial professional development. Temperature and humidity were measured with the HTU21D sensor. The Ideal moisture level is between 40-60% humidity. If moisture is too low there will be no growth and if it is too high there will be anaerobic bacteria and it will smell. The optimal temperature is between 40-50 °C, which is easily measured with a sensor or standard thermometer. PH is a measure of the soils acidity and it is important to keep it close to neutral (7) by maintaining a pH between 6 and 8. PH can be measured with a sensor but it involves taking a sample on a pH strip then reading it with a spectrometer to determine the color. An electronic sensor was not used due to high cost and because an approximate reading could be easily achieved far cheaper with test strips. These range values should be used as a basic guide and starting point in composting. Achieving the optimal balance ultimately depends on the environment and type of biomaterial in the pile so some experimentation will need to be done with each compost mix.